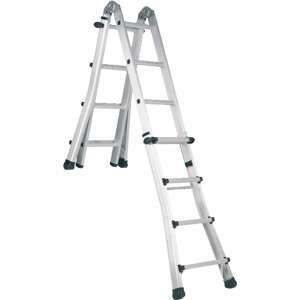 The Telesteps ladders were the world’s first telescopic ladders. Manufactured in Sweden these ladders have been the recipient of 10 international awards for innovation and quality. Built to the European EN 131 standard they are approved for both domestic and trade/ professional use. Closed they can squeeze down to a tiny 79cm high by 48cm wide. That means they could be stored in the cupboard under the stairs or in the boot of your car. At as little as 9.5kg they are also easily portable, and with the carry bag can be taken literally anywhere. Open, however, is a different story. These ladders have a maximum height of 3.3m, that’s almost 12 ft high. Because they are telescopic they are never too short or too long for the job in hand. You choose the height you want the ladders to be and they then lock securely and safely in to place.